Hello. 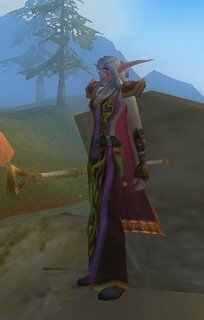 My name is Katrina, and I’m…a WoW addict. It’s been five months since my last raid on an orc village, but last night I fell off the wagon. I hooked up with some of my old friends from Azeroth, one thing led to another, and before I knew it, I was riding my giant tiger across the sands of Silithus in search of the Duke of Fathoms and his treasured Darkstone Claymore. I first met WoW in the strangest of ways–as an assignment of sorts from a marriage enrichment book. I don’t remember the title, but it had a lot of stuff about needs in it. And according to the book, one of a husband’s deepest needs is for “recreational companionship.” To put it simply, he wants his wife to enjoy doing some of the same things that he enjoys doing, so they can do them together. Apparently, many of a man’s most emotionally fulfilling moments occur when he’s having fun (a useful bit of knowledge and perhaps a little foreign to women, whose most emotionally fulfilling moments occur when they are watching their husbands do the dishes without being asked.) The author went on to challenge me, as a wife, to choose one of my husband’s favorite leisure activities and try it out. “This game–this…whatchamacallit? Warcraft? Tell me about it. I’m interested in what you like, honey.” And with the air of someone who is giving a great gift, I pulled up a chair next to him and prepared to be bored out of my mind. “Well, it’s kind of hard to explain it–let me just show you,” he said, and pulled me eagerly down into The Captain’s Chair. Pretty soon he was helping me to create my very own character, “just for fun” of course, and as I brought her to life, carefully choosing her race (night elf), her class (druid), her hair color (white), and even the distinct pattern of her facial tattoos, I had a grand moment of realization: I was having fun, and, even better, so was Paul. I named my elf Sundancer, and as she set foot on the mythical world of Azeroth, I felt the first faint stirrings of excitement and new adventure spring to life inside me. Two minutes after my character’s birth, I killed her by accidentally running her off the edge of a very tall tree. Stupid controls. Paul thought it was funny, at least. I played for ten more minutes, trying to master the simultaneous use of the keyboard and the mouse while Sundancer careened all over the game’s verdant green landscape like a drunken kangaroo. Thoroughly intimidated, I finally logged off, content at least in the knowledge that I had racked up some major marital brownie points for even making the attempt. The next day, I did four loads of laundry, emptied and filled the dishwasher, made the beds, and mopped the floor (I can’t remember why–I usually reserve that kind of housecleaning for special occasions, like papal visits and inaugural balls.) About halfway through the dusting, I felt it: a nudge, an itch, an urge. Whatever it was, it pulled me across the living room and over to the computer. Turning it on, I double-clicked the World of Warcraft icon, closed my eyes for a moment, and opened them to find myself under a leafy emerald canopy, surrounded by the lush elven forest of Teldrassil. World of Warcraft is a total immersion adventure game. At its simplest level, it is the story of an ongoing battle between the Horde (Boo! Hiss!) and the Alliance forces in the fictional world of Azeroth. Players choose their sides, create their characters, and start out in the game at level 1. Each race has its own “newbie” area, where players learn the mechanics of the game as they fight and kill beasts and complete quests. Every kill and every quest rewards the player in XP, or experience points. As points go up, so does your level. As your level increases, you move beyond the newbie area and out into the whole wonderful wide world, full of dramatic landscapes and strange creatures. And here’s the thing: you’re playing with real people. Human beings from all across the world (the real one), transformed through digital magic into dwarves and gnomes and elves and trolls, are all caught up in the same story, working together on the same quests, forming marauding bands and honorable societies in pursuit of glorious adventures. From the moment I first teamed up with a fellow player to rescue the Sacred Relics of Wakening from the Ban’ethil Barrow Den, I was hooked. Hooked! It was like being inside of a fantastic novel, only I had control over the plot. I could be a hero, or a villain. I could uphold the noble ideals of loyalty, selflessness, and sacrifice–or I could swoop down to ninja loot** the epic sword and teleport back to Moonglade, leaving my erstwhile teammates snarling and cursing in the middle of a failed raid into enemy territory. It was intoxicating. Soon I was using Caleb’s naptime, the time I used to spend on housework, to vanquish the fierce naga tribes of the Zoram Strand. I was building block towers with the kids while secretly daydreaming about epic armor pieces and PvP*** battles. My online friends and my real life friends were getting equal time. When I finally confessed my secret WoW addiction to Paul, his initial delight quickly turned to dismay as we started to haggle over whose turn it was to use the computer, a heretofore unheard-of problem in our household. I should have known things had gotten out of hand when it was me–yes, me–who brought up the idea of buying a second computer and an additional WoW account so that we could play together. I’m sure that Paul’s geek buddies fell over backwards with envy when they heard about it. As for me, I was afraid to tell any of my girlfriends that I had become a computer gamer, knowing only too well the merciless teasing and puzzled head-shaking that would ensue. And yet, I played on. A few months after that first dizzy fall from the giant tree, I reached the pinnacle: Level 60. The highest you can go. I shudder to think of the gaming hours I spent in pursuit of that lofty goal, and yet my chest still swells with pride as I remember the moment I finally crossed over from geek accessory to gaming elite. Summer came, and with it, the deep, wild longing for outdoor romps and sun-soaked days. As the time we spent in Azeroth waned, Paul and I talked idly about quitting WoW to focus on doing other things. One day, we did. And I felt…free. I played, I walked, I wrote long, meandering prose and mediocre poetry in my journal. I had Idaho adventures. I didn’t miss WoW, because life was pretty wow. It was a beautiful summer, an invigorating autumn. But now winter is here again, and the light has fled. There will still be lively hours of rolling in the snow and hiking in the crisp, cold air, but most days will be spent in delicious retreat from the biting wind, wrapped in sweaters with hot cocoa in hand. Living the life of the modern caveman, we’ll safely tuck ourselves away indoors. It was no surprise, then, last night, when I heard once more the siren song of Azeroth, calling me to fresh adventures. It was not so coincidentally timed with Paul’s showing me the preview for Blizzard’s soon-to-be-released World of Warcraft expansion pack. Ten new levels, two new races, and a vast range of never-before-seen lands to explore. I am aquiver with anticipation. Besides, I can quit whenever I want. For those who are interested in the fascinating and frightening psychology of MMORPGs, here’s an interesting site. OMG! You’re HER…my hubby’s girlfriend we’re always teasing each other about – his dream girl that would sit & play MMORPG for hours on-end 🙂 You see, my hubby is an WoW addict too – it’s a nightly event in this house. It’s a sad addiction really. I can cancel the credit card that the monthly fee charges too, only for him to set it up with another card! He’ll be up until the wee hours of the morning playing and pillaging, having bday celebrations and getting intoxicated in the online pub. It’s an awful sight really; to see him stumble around, slur his words and watch him lose his clear vision due to the ‘fun’ he’s having, but it is, after all, a bday party for another WoW teammate. I think hubby has 2 characters – both names that refer to Linux OS brands – but I cannot remember which ones. He’s always saying I should ‘play’ with him, but seeing as I’m about as far away from a gamer as any woman, I haven’t brought myself to try it…yet. You’ve given me inspiration – maybe not WoW, but another game…baby steps, you know! And, by the way, things are fine around here. Michael started a new full-time job 2 weeks ago, so my life has been turned upside down. I’m still trying to figure out how to keep my sanity while having all the kids, by myself, all day, every day! Not something I’m used to because he’s always been around the house more than away from the house. So, my adventures have been too chaotic and too emotional to post lately 🙂 Suffice it to say, I’ll get back on the band wagon soon enough! and my mom today completed her first Minesweeper (beginner) game. sigh, it was nice knowing you, Katrina. See you next spring. Maybe you might be able to spare a moment or two for a bite at my Thanksgiving table? I joined my husband in one of his “hobbies” once. He donates to the Alaska Blood Bank every two months. What a disaster!! They stabbed both elbows and failed the first day. The second time I gave blood and no one told me to eat the cookies, so I nearly passed out at the mall. I’m so not addicted to that. LOL Well I had this urge to play just this weekend. I admit I lost interest when I had to start relying on other people more & more to help me in quests. I just wanted to do what I wanted WHEN I wanted. Not be beholden to others & THEIR time. Sri–One step at a time…the information age can be a scary place! Debbi–Next time, I recommend going straight for the cookies. No cookies, no donation–that’s the deal! Nice. It took an hour for me to get my gf used to control, another hour to talk to her about game concepts, another hour about attacking/looting. Then she got lost in the spider cavern at Shadowglen and quit wow.